Once upon a time, back in the mists of time, the Greek people used to believe that Mount Olympus was the residence of their gods. This was probably because it seemed high up and remote, and therefore a likely place for the gods to live. Nowadays, however, it is not as remote as it used to be, for it is a popular haunt of mountain climbers from all over the world. Having climbed to the summit of Mount Olympus time and time again, this mountain occupies a special corner in my heart. Its imposing presence conjures up images and pictures of endless beauty and its flora and fauna - e.g. larch, oak, blue-bells, aromatic herbs, squirrels, wild goats, wolves and boars, constitute a sight for sore eyes. The emerald fields and the luxuriant vegetation of its unspoiled forests, stretching to infinity, make you feel serene, fulfilled and refreshed. This mountain was declared a natural reserve for animals in danger of extinction in 1937, and is the habitat of many rare species of beast and bird of prey. You can see eagles soaring on thermals high above the forest like monarchs surveying their kingdoms. If you ever happen to come to Katerini, this is the place to visit. Beautiful is not the word for it. It is fantastic. Climbing to its peaks is a wonderful experience which nobody should miss. When I go there I feel isolated from the worries of life in the city. You should at least have a bash at it ! Prionia (1,100 m) - Spileos Agapitos (2,100 m) - Mytikas (2,917 m). Mytikas is the summit of this mythical mountain and is usually wreathed in vaporous mists. Climbing to this summit is a very strenuous task, but the view from there is stupefying. If you're lucky and the visibility is good then you will be able to see Katerini, many villages and even Athos. I have been there personally and this experience has been etched on my mind for ever. Of course this is not the only itinerary you can follow to reach the peak. The route : Barba - Kolokythia - Petrostrounga (1,700 m.) Skourta (2,485 m.) - Refuge Giosos Apostolidis - Mytikas is honestly more sublime as well as being equally breathtaking. The goal of both itineraries is Mytikas, the supreme peak of the mountain, but this is not to suggest that it is the only peak that commands a prospect of enchantment. Mount Olympus has got many other astounding places to visit. Anyway, I know from first-hand experience the beauties of this magnificent Greek mountain and I imagine that if you took the initiative to visit it, you would savour every moment of it. Under no circumstances is this an experience to be missed ! Despina Papathemelis is a 15 year old student at the third High School in Katerini. She started English lessons with John Foss when she was six years old, passing the Cambridge First Certificate with an A grade at the age of eleven and both Cambridge and Michigan Proficiency examinations at the age of twelve. She obtained an overall B grade in the Cambridge exam with an A grade for Composition and Use of English. 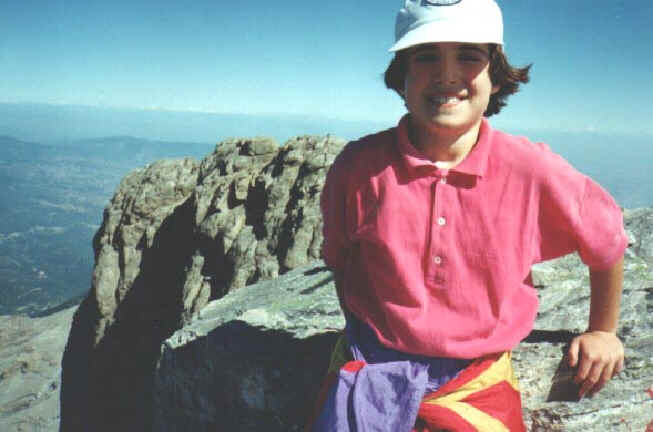 She first climbed to the summit of Mount Olympus at the age of eight (see picture above) and has been up on several occasions since Her interests include art, music and reading and sport  she was placed first in her swimming class in the Northern Greek championships.